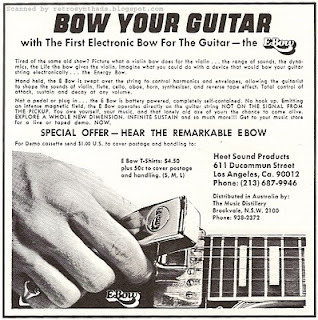 Heet Sound Products E Bow for guitar, from page 26 in Synapse Magazine May/June 1977. I am into guitar pedals, and anything else that will create and/or modify sound. I eat up sites like Chris Carter's CCCL blog. And just like CCCL blog makes me want to buy more guitar pedals, this thing actually makes me want to buy a guitar. Anyways, I thought it was cool that Heet had decided that '70's readers of Synapse magazine were experimental enough to really get into the E Bow. In fact, in the month previous to this ad showing up, it looks like Synapse made the first move by featuring the E Bow in the What's Happening section of the March/April 1977 issue. "New for the progressive guitarists is a hand held string sustainer that works on an electromagnetic principle. The E BOW (Energy Bow) will sustain any steel string indefinitely with total control over attack, sustain and decay without any distortion, allowing further possibilities for guitar and synthesizer interface. The E BOW is available from Heet Sound Products." 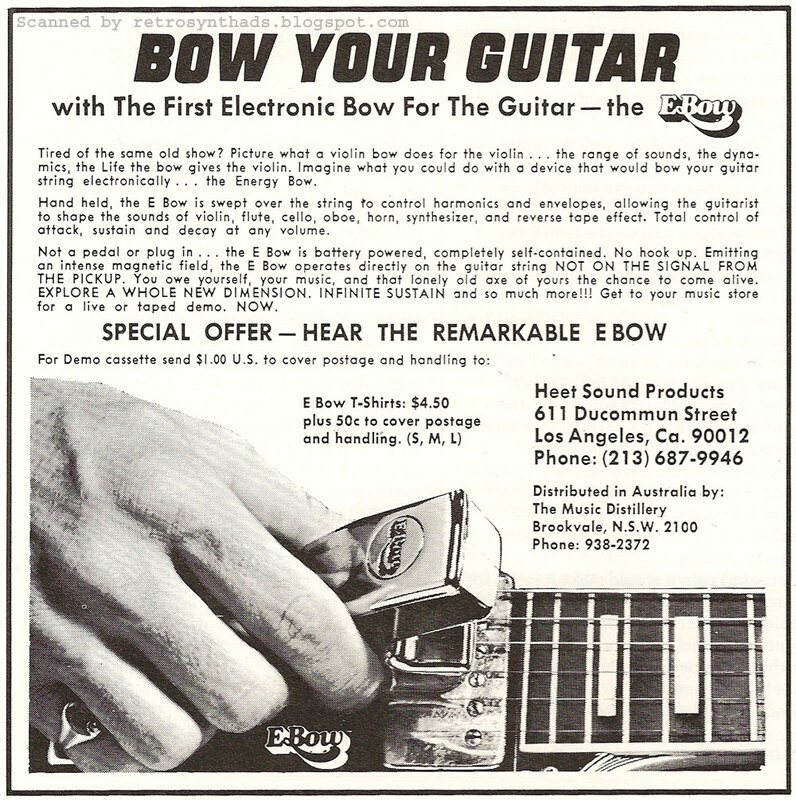 The next month, the same month this ad began to appear, the E Bow was reviewed in Synapse in the "Equipment" section. The first paragraph describes it as "a perpetual sustain device for any steel string guitar, electric, or acoustic." It goes on to say that "at $125.00 list it's one of the most expensive distortion devices you can buy for a guitar. It's definitely priced for the professional market." You can read the full E Bow review online at cyndustries.com, where all the issues of Synapse have been scanned. The coolest thing is that the E Bow is still around. According to their Web site, the concept was first 'inspired' in 1967, with a working model created in 1969. The E Bow was then introduced at NAMM in 1976 in Chicago, which means that these advertisements in Synapse were probably some of their first. YouTube has a number of E Bow videos, and two in particular by MacDaddyMusicStore helped me to understand how the E Bow works and observe some live guitar playing. I also did a bit of Googling to see if there was anything else out there that sounds like the E Bow - and I couldn't really find much, unless you think of yourself as a really talented guitarist and know your rig well. GuitarGeek.com has a thread from 2003 with a couple of suggestions about how one might get a similar sound, and a more recent thread on musicgearreview.com from 2009 quickly turned into an discussion on experimental sound design. I'm kinda surprised at just how popular the sound is. I would never have guessed (again - I thought I should mention that I'm not a guitarist). The E BOW Web site includes *a lot* of reference information, including sound clips from songs from famous bands like R.E.M., Smashing Pumpkins, and Pearl Jam, a long list of artists that have used the E Bow (Bill Nelson! Camouflage! Cocteau Twins! Flock of Sea Gulls! ), quotes, YouTube videos, their own videos, and more. Definitely check it out if you even *think* about thinking of buying one of these devices. End note: Awesome logo - but so small in the ad. But I could get a t-shirt with the logo for only $4.50 in 1977! I couldn't find any merch on their Web site - I would have bought one right away. I got one of these when I bought my discount keyboard. It's really a great tool, and I agree that there isn't anything else out there that sounds the same.